Why is the William Nylander Situation so Complicated for the Maple Leafs? Why is the Nylander Situation so Complicated? It’s almost mid-November and if William Nylander isn’t signed by December 1, he will sit out the entire 2018-19 season. Nylander’s camp is reportedly still asking for a long-term contract with an annual average value (AAV) of $8 million, while the Toronto Maple Leafs seem to be offering something in the $6 million range. Why are the two sides so far off? 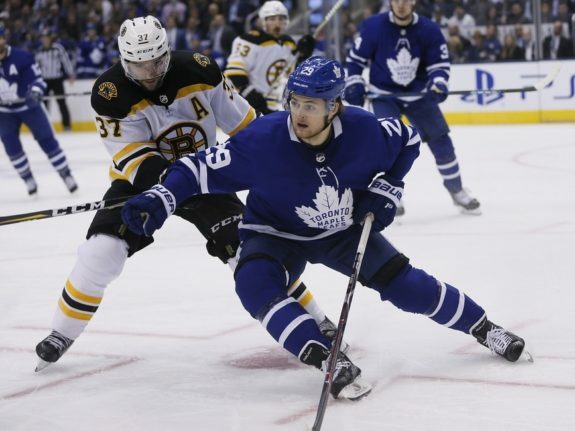 It’s mainly due to the different ways you can slice the data when looking at his comparables, differing viewpoints on whether or not he should take a discount to help the team, and the Maple Leafs’ salary cap situation. Nylander’s stats can be compared to three players that signed contracts in 2017, David Pastrnak, Leon Draisaitl and Nikolaj Ehlers. These three are commonly referenced when talking about a potential Nylander contract. William Nylander comparables in the season prior to signing their contracts. Data compiled by David Petrie – THW. Looking at the season immediately prior to signing their contracts, you could say that Nylander would be lucky to get the Ehlers contract (seven years with a $6 million AAV). Ehlers had five more goals and three more points than Nylander, and Nylander’s production was nowhere near as good as Pastrnak’s or Draisaitl’s. In 2017, the salary cap was $75 million and in 2018 it is now $79.5 million, which is a 6% increase. If we apply that increase to Ehlers’ contract, we get $6.36 million as a potential deal for Nylander, and his agent looks crazy for asking for $8 million. William Nylander comparables’ career statistics prior to signing their contracts. Data compiled by David Petrie – THW. Lots of players take a few years to ramp up their scoring. For example, Pastrnak had 27 points in his first season, 26 in his second season and then exploded in his third season for 70 points. Nylander put up 61 points in both his second and third year in the NHL, so his career numbers look far better than his single-season numbers when comparing him to his peers. Looking at his career numbers, Nylander is far better than Ehlers, better than Pastrnak (fewer goals but more assists) and very similar to Draisaitl. With this view of the numbers, you could say that Pastrnak’s contract is the minimum, and if we add 6% for the salary cap inflation, that would be 6 years and a $7 million AAV. The maximum would then be Draisaitl’s contract, and if we add the 6% inflation to that it would be 8 years at a $9 million AAV. All of a sudden, Nylander’s request for $8 million doesn’t seem so unreasonable, particularly if it is for 8 years. We haven’t even included advanced stats, draft positions, non-NHL accomplishments (Nylander is a World Championship MVP for example), and already there’s a huge discrepancy between what the Maple Leafs are offering and what contract Nylander is willing to sign. Maple Leafs general manager Kyle Dubas is trying to manage a salary cap situation that includes big upcoming deals for Auston Matthews and Mitch Marner. If he’s able to get each player to settle for less than they want, the salary cap room could add up to the ability to re-sign Jake Gardiner or to add help on the right side of the defence. President Brendan Shanahan went on record stating that he expects the Leafs’ young stars to make financial sacrifices to keep the core together. If Nylander does end up only being a 60-65 point player, shelling out $8 million per year to him would be too much and will hinder the team’s ability to add other players and win a Stanley Cup. From Nylander’s perspective, if he signs an 8-year contract now, at age 22, he will be 30 years old at the end of it and may only get one more contract before the end of his career. That gives him just two opportunities to maximize his earnings in a violent sport where an injury could end his career at any moment. One can hardly blame a person for wanting to be paid what they believe they are worth. We also have to consider who Nylander is getting advice from. William’s father, Michael Nylander, is a former NHL player and is apparently stubborn and could be difficult to negotiate with. It’s difficult to see William taking a home-town discount if his father is telling him not to. How would you feel if your employer asked you to take less money than you believe you are worth for the betterment of the organization? There is word tonight TOR has asked teams to indicate what they would offer — and will not trade — for William Nylander. Still think their first choice is to sign him, but we have entered the next stage, with 20 days until the deadline. We’ve seen young forwards traded for defencemen in the past, like Jonathan Drouin for Mikhail Sergachev or Ryan Johanson for Seth Jones. If Leafs fans think they will get that kind of return for Nylander though, they are kidding themselves. Whatever team that trades for Nylander would similarly have to deal with his $8 million contract demands and the Maple Leafs could be considered desperate in trade talks. It’s likely that opposing teams will low ball the Leafs and a trade would be similar to the Taylor Hall for Adam Larsson disaster. When you have a situation like this where the data available tells two vastly different stories, the best thing you can do is get more data. A one, two or three-year bridge deal would allow Nylander to prove whether he is worth more than the $6-$7 million range or not and would keep him under team control as he would still be a restricted free agent at the end of it. The Maple Leafs will have salary cap issues next season, as Matthews, Marner and Gardiner will need new deals, but they have over $12 million in cap space this season. An overpaid one-year deal may be the best thing for both sides to get Nylander playing and address this again next summer when more information and more options are available.